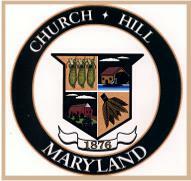 Church Hill's local government consists of 3 elected Commissioners, a Town Administrator and Administrative Assistant. Church Hill was incorporated in 1876 and named after St. Luke's Episcopal Church, referred to as "Church on the Hill", which was erected in 1732 near the Town's center. One Commissioner is elected by the voters each year for a 3 year term. Elections are held the first Monday in June.